I have re-opened after the Christmas and New Year break this week, although with all this beautiful snow around and so many roads and places closed, it still feels kind of holiday-ish here in Herefordshire. Working as I do in a garden office I'm afraid I have no excuse not to make it into work, but at least I am blessed with a lovely (and incredibly short) walk to work and some beautiful views from the windows. The down-side to all this glorious snow is that my parcels aren't being collected for the second day running which means that our UK orders are being a bit delayed at the moment. I do apologise to anyone who is waiting for something and want to reassure you that every order is packed up and ready to go just as soon as UK Mail feel able to make a collection. Tomorrow hopefully. 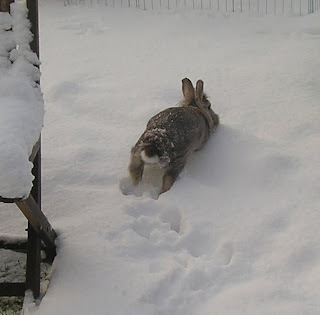 Took a few snaps of Humphrey in the snow earlier - he quite likes it I think, I love the shot of him running through the snow towards his summer run, I have captured him 'mid-leap' and you can see his paw prints in the snow and his legs in the air! What a cutie, and look at all that snow. Stay warm and cozy. bless him he's gorgeous ! Happy New Year to you too Charlotte and Humphrey!! 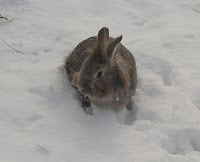 awww loved seeing humphrey in the snow!! Hi Charlotte, yes you did thank me for your card. I am so please with my curtains, they are just a cheap pair from argos but look so special now with the ribbon and brooch. well...my little buisness...now that the littlest has started preschool, and theres no more babies on the way, i really need to get working again, just something small, money isn't really a problem, so it's just something for me. I plan to completely sort out my house first and revamp my craft room and then start making...hearts, cushions, bags, cards, that sort of thing. set up a little webshop and start selling at craft fairs, much like alot of other bloggers. I've been wondering what to do for years! i used to want to set up a day nursery(i'm trained as a nursery nurse), but that seems too much like hard work!! and i've thought about nutrition and photography, but when i started this blog a year ago everything sort of fall into place with my love of crafts. 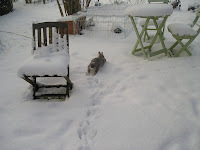 Hi Charlotte, thanks for visiting my blog :) Your Humphrey seems to love the snow like my two - they keep on going to the patio door, wanting me to open so they can binky in the white stuff, LOL! Happy new year to you, and hope to see more of Humphrey on your blog (I shall put you in my blog list to visit). Humphrey! He is so sweet playing in the snow. 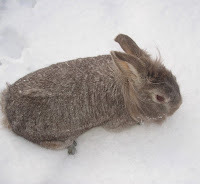 I didn't let my bunnies outside this year to play in the snow-- I wasn't sure they would like to cold. He looks so happy now I am sad I didn't let them out.